The meaning of the first three words of the U.S. Constitution—“We the people…”—has changed over the course of our nation’s history, and who constitutes “the people” is a topic of fierce debate even today. Constructed entirely from shoelaces donated by members of the public, a new monumental artwork by artist Nari Ward honors these three words in a permanent display at the New-York Historical Society. Born in St. Andrew, Jamaica, Nari Ward now lives and works in New York. Nari has been greatly influenced by his geographical surroundings, which is reflected in his dramatic sculptural installations composed of systematically collected material from his urban neighborhood. Nari’s work has been widely exhibited around the United States and internationally, garnering prestigious honors and distinctions. Acquisition of We the People generously underwritten by Diana and Joe DiMenna. 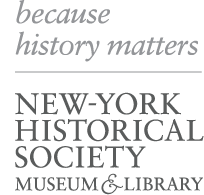 New-York Historical Society extends its appreciation to Professor Akhil Reed Amar, Sterling Professor of Law and Political Science, Yale University, for allowing us to draw directly from his writings The Constitution Today: Timeless Lessons for the Issues of Our Era and America’s Constitution: A Biography. These words sought to do more than promise popular self-government. They aimed to set it into motion. But the Constitution remained only a proposal until “We, the people” voted to accept it. In 1787, when the draft of the document emerged from the special meeting in Philadelphia, an enormous task of political persuasion still lay ahead. By its own terms, the proposed Constitution would go into effect only if ratified by specially elected conventions in at least nine of thirteen states, and even then only states that said yes would be bound. These ratifying conventions aimed to represent “the People” in a particularly emphatic way. The ratification process gave vastly more people than ever before in human history the opportunity to decide how they would be governed. The Constitution’s proposed rules were written in plain language precisely so that ordinary folk could read and debate the proposal. Taking their cue from the Preamble’s bold “We, the people” language, most states lowered or eliminated property qualifications for voting so that a uniquely broad class of citizens could vote for delegates to the ratification conventions. New York, for the first time in its history, let all adult free male citizens vote for the delegates. No property qualifications, no race tests, no religious qualifications, and no literacy tests were applied. The elected New York delegates voted yes on the Constitution several months later. During the entire year of public debate that led to ratification in 1788, virtually no censorship occurred and no one died in political violence. The citizens who fiercely opposed the document were not vilified or ostracized. Instead, their reform suggestions were considered respectfully and many of these ideas were incorporated into a series of amendments that emerged from this bottom up process. We should also note the extraordinary religious inclusion championed by the document. Unlike in most other places on the planet, the Constitution opened its doors to office seekers of all faiths and philosophies. America’s Founders did little, however, to eliminate the worst feature of older forms of society that stained our soil: human slavery, which entitled some to lord over others by dint of birth. But in the wake of the Civil War, a low-born commoner named Abe Lincoln proclaimed the need for a new birth of freedom—a second Founding of sorts. Americans have nobly built upon this foundation, repeatedly adding the words “the right to vote” in a grand colonnade of amendments promising a permanent end to all sorts of electoral discrimination and exclusions. The Fourteenth Amendment (1868) proudly affirmed that all homegrown Americans are “born” with equal civil rights. Just as a child born black or brown enjoys the same civil rights as a child born white, so, too, those born female are equal in civil rights to those born male. The Fifteenth Amendment (1870) said that the "right of citizens of the United States to vote shall not be denied or abridged by the United States or by any state on account of race, color, or previous condition of servitude." A half-century later, the Nineteenth Amendment (1920) guaranteed woman suffrage and thereby revolutionized American politics. And the 26th Amendment (1971) lowered the voting age from twenty-one to eighteen, prompted by concerns during the Vietnam War that young men asked to risk their lives for their country should have the right to vote for their political representatives. As Americans think back on the last two and a quarter centuries, we should also think ahead by the same amount. What will and what should the Constitution look like two hundred years hence?